After a few delays and phone calls to schedule a meeting, i finally got to test drive the electric Fortwo in downtown Lisbon. A friendly salesperson asked me if i had any experience with electric cars (Negative answer), making made a brief introduction to the car and technology, saying that it was the fuel source of the future. After sitting in the car and explaining me the main features in the car, i finally got to drive it around town, where it felt just perfect, small enough to travel around through narrow, ancient streets of old neighborhoods, and powerful enough to climb steep hills and sprint through heavy traffic. Oh, and because it doesn't have that nasty gearbox of ICE Smarts, it is a much more relaxed drive than their gas siblings. Back to the dealership, i considered that the car didn't justified the huge price difference regarding their ICE siblings, to which the sales person replied that he couldn't make a significant discount on it because few were sold and there wasn't enough scale to lower the price, leaving the possibility for me to buy a gasoline Fortwo or renting the Fortwo ED as alternatives. Smart believes that electric cars are still for a few single-minded people that buy more with their heart than with their wallet. I've saved the best for last, when i got into the dedicated BMW "i" dealership in downtown Lisbon (In a strategic spot, with other dealerships nearby, like Audi, Peugeot, Toyota or Chevrolet), the first thing that it struck me was how different it looked from other dealerships(1), Premium or non Premium, with minimalist decoration and a nice contrast between colors, it looked more like i've entered an Art Gallery than a car dealership. Two minutes after getting inside the dealership, i'm greeted by a salesperson in a "i" polo shirt (Like every other staff members), and after a few early questions, the i3 is showed to me by him, with the salesperson proving to be a devoted fan of electric cars and very much focused in highlighting the top selling points of the car. After this first presentation, i'm introduced to another staff member that would be with me during the test drive. Before getting into the car, i'm asked to lend my ID car for them to register my data on their Db (Glad for them i'm not paranoid about this kind of stuff). The test drive had predetermined route, that pretty much covered all kinds of roads and situations, with the added bonus of visiting one or two more scenic places in Lisbon. After stopping in Monsanto Green Park, the staff member (An electronics engineer), explained me how to plug and unplug the car to a fast charger, encouraging me to unplug it. During the test drive i made a few questions on the technology behind the i3 (Materials, charging rates, batteries, software, etc), to which he replied willingly and accurately. Back to the dealership, i'm introduced to a third member of the staff, "which would assist me through the configuration of the car" (It takes a specialist to do this?!?!?). During the extensive configuration of the car, at times it felt more like we were doing Interior Decorating of a house than a car, so many were the options. (Yes, it does). After more than 5.000 euro of optional equipment later, we finished the configuration and by then the salesperson joined us and asked my opinion, i objected that the price was too high, to which he replied that there was a lot of new technology involved in this car, so the price had to be high. I asked if they had any demonstration car, but they responded that BMW Portugal had yet to put any demonstration i3 for sale, giving the possibility for me to rent the car at an interesting fare. The best plug-in car i've tried and probably the best staff in selling electric cars. But be careful with the options list as you might end up with stratospheric numbers in an already overpriced car. There were 24.414 plug-ins sold last month, representing the second best sales month ever for plug-ins, only behind the freak event that was last December, where 28.079 EV's were sold. This great performance shows in the individual sales, where four cars got new sales records, those being the Prius Plug-in (2.932 units), Fusion Energi (1.352), BYD Qin (1.008) and BMW i3. Another sign of a good global performance, is that seven cars sold in the thousands, when a year ago only four achieved those numbers. Looking to models ranking, the leader Nissan Leaf lost another 1% in share, with the less than stellar performance in Europe to blame. Only one position change this time, with the Ford Fusion surpassing the BYD Qin to reach #6. Out of the Top 10 but with deserved references, the Renault Zoe was #9 in May, while the Ford C-Max Energi was #10, with this last one ending just 17 units away (3.015) from the VW e-Up! in the YTD ranking. In the Manufacturers ranking, the star of the month was Toyota, #2 in May and running away with its #4 from Chevrolet and Ford. The #7 BYD continues to improve with yet another sales record (Now at 1.261 units/month), but with Renault back on track (1.450 units sold), the fight for #7 should be interesting. 1 - Which model will be #2? And #6? And #10? 3 - Will the BMW i3 reach four digit sales? 4 - Which manufacturer will be #5? 5 - Can VW remove Chery from #10? After a brilliant 2012, the Renault Twizy fashion sales slumped, leaving the french manufacturer no other choice than to go after fresher, less crowded markets. That's why Renault expanded Twizy sales to markets like Bulgaria (14 Twizies registered in 2013, two this year), Turkey (2 units in '14), or Morocco (7 in '13, 18 this year), but also to less obvious places like Kuwait (2 units this year) or Dubai (16 Twizies thus far!). The numbers show an interesting balance between both versions, but there are differences from market to market, whereas the Northern Europe prefers Rex (Denmark, Sweden), the Central and Southern Europe tend to go for Bevs (Italy, Austria, Belgium), with the exception of France, where Rex is the favorite one. The German market is continuing to improve (0,44% vs 0,33% EV share last month), with the Outlander PHEV winning consumers preferences in May. China is going from strength to strength (0,15% share vs 0,08% last year), with monthly sales going up for the sixth month in a row(! ), propelled by the ever-improving BYD Qin and the arrival of the Tesla Model S.
Here are 16 top markets in the world regarding plug-in sales, making the largest contribution for the half a million EV's rolling around the world. EV's are basically present in two african countries, Morocco, with the 18 Twizies sold, and South Africa where there's unconfirmed numbers saying that some 90 Leafs were sold to date. It's here that things get interesting, without direct contact in any market (Apart from the limited production of the Venucia "Leaf" in China), japanese and chinese cars share the ranking, and with the BYD Qin sales growing every month, i wouldn't be surprised that at some point in the near future the chinese plug-in would win the Best Selling EV title in Asia. Spain finally got a breath of fresh sales (119 units, best month of the year), while in other markets, sales are so brisk that it took them just five months to break last year numbers, like in Belgium (896 sales this year, 828 in '13), Poland (30 units in '14, the same as last year), and June comes with the promise of other markets reach the same goal, like Denmark (493 vs 522) or Sweden (1.677 vs 1.922). 3 - Where will the Outlander PHEV #1? 5 - Where will Tesla make a comeback and reach #1's? 6 - Will the BMW i3 continue to win Best Selling titles? There were 1.553 new plug-ins in Japan last month, selling 229 more units over the same month last year, with no relevant changes in the ranking, the Nissan Leaf (743 units sold) was Best Selling EV for the fourth consecutive time, increasing some 200 units its advance over the #2, the Outlander PHEV (563 registrations). Looking at the manufacturers ranking, Nissan (47%) continued ahead of Mitsubishi (45%). Finally a decent month for this asian market, with 76 units sold, 64 of them being Kias and 38 belonging to the new Soul EV, landing this month and going straight to #1 in May. Looking at the YTD ranking, Kia won the models (Ray EV) and manufacturers leadership, with no intentions of letting it go in the near future. A final mention for the BMW i3, registering seven units, the little german car is starting to gain traction in South Korea, will it be a relevant player here? Click here if you missed the first chapter. The first Test Drive was of the Renault Zoe, a Saturday that was an Open Day at the french brand dealerships, a lot of people were present, most of them looking to experiment the Clio and Captur, but there was also one guy (An engineer of some sort) testing the Zoe. After several minutes i finally got to speak with the salesperson responsible for the Zoe, the first thing he did was a small query about driving habits (How many kms do you make a day? Do you have a second car? Do you frequently travel far? ), justifying it with the purpose of being sure that the Zoe was the right car for me (I made sure it was), after a brief description of the car and how it worked, we finally got to drive it. The test drive consisted in a few minutes around the neighborhood, without the possibility to try it on open road (And squeeze the accelerator), but during those minutes i found the Zoe comfortable and easy to drive, a bit like an upscale Clio. 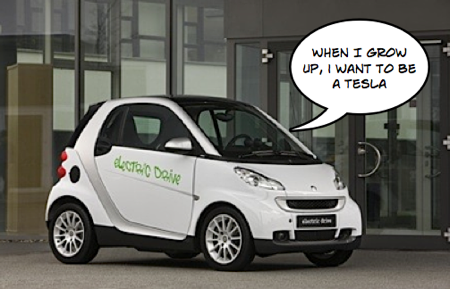 Towards the end of the test drive, i gave thumbs up to the car but said that it was too bad that you couldn't buy the batteries, because the money you give for the renting would be enough to buy fuel of a Clio diesel, that was cheaper than the Zoe. The salesperson replied that the brand policy was to rent batteries because they were evolving fast and by renting them the customer didn't had the trouble to have a dated battery (Valid Point), reinforcing that batteries lose performance with time and as they are rented, they could be replaced before that happened or before warranty ended, saying that he knew cases of Toyota Prius (I said i had one) batteries gone bad that had ended the warranty and the car couldn't run because of it (?!?!? ), which implied that the customer had to waste thousands of euros to get his Prius running. Back to the dealership, the configuration of my Zoe began and after saying that it was a bit too expensive for my taste, he replied that he couldn't make any discount because Renault has low margins on the Zoe, offering instead a nice deal on a Clio Tourer diesel as an alternative, when i asked how much was the demonstration car, he said that it wasn't still for sale, and he insisted on the Clio Tourer deal or a low-spec Captur. The car was better than the sales service. The following test drive was at Nissan's downtown dealership, along with the parked Qashqai and Note there were two Leaf (One white and another grey), i got to try the grey one, the salesperson let me choose the test drive tour, so i've driven it in all kinds of roads, congested city areas, highway, mountain roads...You name it. The salesperson was pretty confidant and experienced with the car, explaining several real use situations with the car, saying he had more than 20.000 kms experience in Leafs. As for the car itself, if it had better looks and a bit more range, i would consider it perfect for me, comfortable, lots of space and just enough power to blast through mountain roads or passing other cars. About those looks...If it only looked as good outside as it looks inside and had 250 kms range i would buy it, as this isn't the case....(Deal-breaker time, sorry Nissan). Back to the dealership, i made a fast configuration of my Leaf and after complaining that it was a bit too expensive for what i expected, he offered me a 3.000 euro discount or a nice deal on the grey Leaf, with some 9.000 euro less on the demonstration vehicle. (Mmmm...nice, for a brief moment i even considered going ahead with the deal). Nissan is selling the Leaf like any other car of its range. And that's a good sign of things to come. A curious note: When i was going to leave the dealership with the car, one customer in a suit realized it was an electric car and asked how much it costed to the salesperson, then asking-guessing for its range: "100 kms range?" When the salesperson replied "200 kms", the suited customer didn't hide his surprise, saying: "That much, eh?!? ", leaving with an approval smile in his face. With 7.783 units sold in May, the European EV market more than doubled sales regarding the same month last year. Looking at the models ranking, the Outlander PHEV was again the Best Seller of the month, with 1.733 units, finally changing positions with the Nissan Leaf (Just 728 units sold, worst result of the year) and climbing to the YTD leadership for the first time, ending one year of Leaf dominance in The Old Continent. Great month for the Renault Zoe, 785 units sold (Best month since last October), reaching #2 in May and although it's still #7 YTD, the french hatch is giving signs of recovery. The Volvo V60 Plug-In, continues to recover and it's now alone in #4. The VW e-up! had a bad month (3 registrations) and dropped two spots to #9 in the YTD ranking.